Have you ever heard that all fashion styles recycle themselves in time? Today’s dressgasm comes from 1895 but it also looks like it could have been a 1985 prom dress, except this dress is exceedingly well-designed and expensive. A polyester or rayon prom dress discarded after a night of drinking and dancing, it is not, but it resembles the princess dresses we all wore in the 1980s. This ballgown is listed on eBay at the moment and it is another acquisition from a museum. The gown is said to have been owned by Blanche Goodhue-Pfaeltzer, who lived in Boston and Paris, and the label inside says Maison Truffert, San Francisco, which was a dressmaker on Taylor Street according to a reference in 1890. 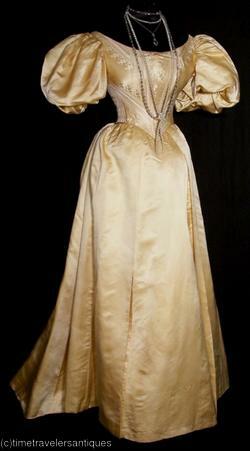 This dress in particular is dated to 1895 and it would have been considered fabulous Boston high-end fashion. If Blance had residences in Boston and Paris, then she certainly had a good deal of wealth at her disposal. Golden silk satin makes up most of this ballgown along with a brocade bodice. 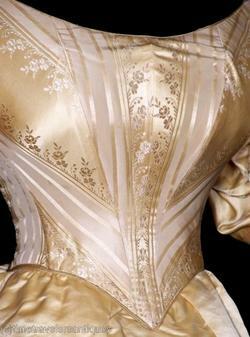 The end of the nineteenth century into the early twentieth century saw the most severe synching with corsetry at the most unhealthy levels. Blanche’s golden ballgown has a bust of 31 inches and a mind-boggling waist of 21 inches, which is not even the smallest I have seen from that decade. The gown is of all French construction with a lace-up back and a bodice lined and stayed (like boning) to give even more structure over a corset. What makes this dress even more unique is that the shoes and stockings are still with it. 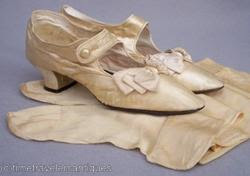 The stockings are made of golden silk and the shoes are high heeled and made of satin. If only 1980s prom dresses were this lovely! >I wore a dress styled very simliar to this in a production of Gilbert & Sullivan's "HMS Pinafore" in which I played Josephine. I love the clothes from this era–very understated and not fussy, yet very feminine.